I just wanted to quickly say that today is my last day studying for my first year in HND Makeup Artistry. Which means its now blogging time for the next 8 weeks! Woohoo! Now back to the actual box! Glossybox June is all about festivals, what you need to have for all the festival beauty this season. 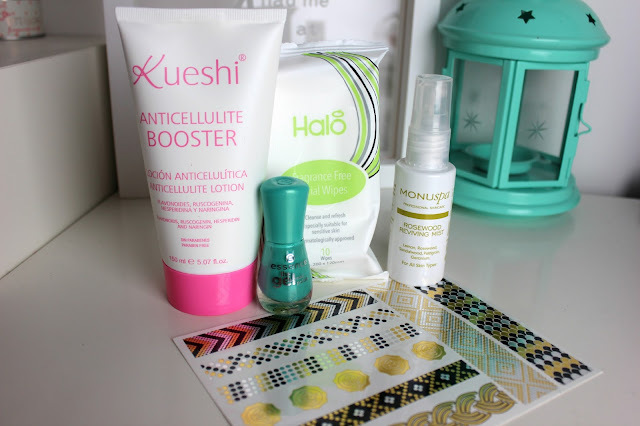 But if your like me and not going to any festivals this year, all these products can be used anyway for a summer pamper. Personally for me I found that last months box, HERE, was really suited products wise for the festival theme. If I could put four of the products from this box with four from last month and just create the ultimate festival box I would. This may be a little strange, but I tend to also judge the box on its weight, as it seems the heavier the box is the better it is. of course theres a few exceptions to that too though. So I was surprised at how heavy this box was, compared to my slight disappointment when opening it. When I first saw these I thought "ugh makeup wipes" I really don't like them at all unless Its a quick cleanse between changes for makeup on a model. However then I started to think, actually this box is for festivals and intact these would be really handy. The Halo wipes themselves are fragrance free and in a travel friendly sized packet, as well as removing waterproof makeup. At first glance these really aren't as bad as I thought they were going to be and I can see how they'd be useful. I personally don't have cellulite and I also kind of didn't get why this product was in a festival box. Until I realised that one of the most popular festival attire choices is short shorts. This is the one product I would maybe take out, great for festival prep, but I thought the box would be more essentials for the festival themed. As a product itself though, I cant really say that I have personally tried it as I don't need to. But I find the smell lovely and not too strong, its almost slightly floral. The texture is almost like a cream, but as soon as you start to rub it in it melts away and almost becomes like a very thin cooling lotion. I really like other polishes that Essence do in their range, I hadn't tried a Gel formulation from them, so Im excited to try it. I've found Essence to be very well wearing, especially for the price. The pigmentation to each coat is fantastic and is opaque with around 2 coats. As well as having quite a large applicator, covering more of the nail and they dry extremely quickly too. The shade itself is very on trend at the moment for this Summer too. Gold Metallic temporary tattoos have become such a huge holiday trend and is probably going to be just as huge at festivals. So Glossybox this month have created a sheet of their own for the box. 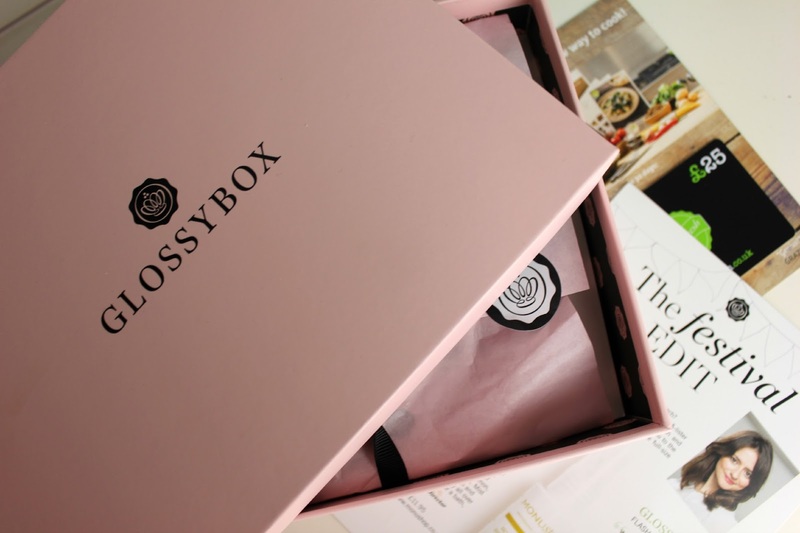 Including their logo, which I cant see me wearing as Im not sure how weird that may be just to have Glossybox branding on your body? The other designs are all lovely though and I'd say are perfect for bracelets, but then here comes the design flaw. They are way too small in length to fit around anyones wrists! A small child probably, but unless you want a half bracelet or a chunky ring, Im kind of a little unsure on how to wear them. I love Monu and their products are always lovely including this little gem. Of course it feeds my rose obsession, while being cooling on the skin, a huge plus for these warmer months! It says you can hydrate, which it does, as well as soothe, but you can also set your makeup with it. I prefer it as a little booster spray through out the day and prefer to use an actual makeup setting spray to set my makeup. Although Im not as disappointed with this months box as to when I first opened it. Im still disappointed with it, I kind of expected more from the box this month. But each individual product is good at what it does, its just not so much for me. My favourite bits would have to be the Essence Polish and the Monu Mist, but the other three Im not entirely fussed over, which is a shame. Sounds like it was kinda of disappointing overall. That's really sad. We all kind of expect a little more from the GlossyBox!